This is a remotely operated vehicle, an ROV, that operates in deepwater to photograph such things as huge sunken ships like the Titanic. Georgia State Road and Tollway Authority is going to open a bank. Not just anybody will get a loan at this bank though, and given the ominous acronym of SRTA, you can probably hazard a guess what sort of projects this bank will approve. It will be called the Georgia Transportation Infrastructure Bank or GTIB. An initial equity stake will be provided by the state of Georgia in the sum of $33.1 million. Another $10 million will be given to the bank for outright grants. The way banks work is that one can theoretically hypothecate $33.1 million dollars of equity by 10:1, 20:1, or 30:1. If the state of Georgia is not going to do that then why call the new leviathan on the scene a bank. I know my diction very well. If you call a thing by its name, it should be known to have the qualities of that name or why call it that? I received such counsel from the Red Queen of Wonderland. How can the SRTA say it is much like a bank when the word “bank” is in its very title? Pure knavery! Of course why would state, regional and local governments need a bank established specifically for them? Aren’t there enough municipal bond writing companies headed up by former mayors of large cities? (Hello, Mr. Maynard Jackson. God bless you, sir.) Isn’t there JP Morgan who already does underwriting and marketing for the state of Georgia? Better the devil you know- not to disparage anyone in particular. Holy sputum! Batman! It looks like GTIB is there to establish subprime lending to some dubious projects. When my lending is limited by traditional lending sources, it usually means I have to get a pay day loan or go to the pawn shop. Imagine GTIB with an enormous junk loan portfolio as underwater as the Marianas Trench. 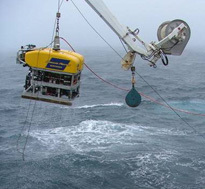 Someday the state will have to contract with Woodshole to get ROV’s(Remotely Operated Vehicles) to help the forensic accountants see what went wrong at such depths. Where Peachtree Meets Sweet Auburn: A Saga of Race and Family, Author: Gary M. Pomerantz, Published 1996. This entry was posted in Tolling News and tagged Toll road hell states rights Federal highway mandates suverting the states bribery Ray LaHood Transportation Secretary Illinois corrupt racket. Bookmark the permalink.